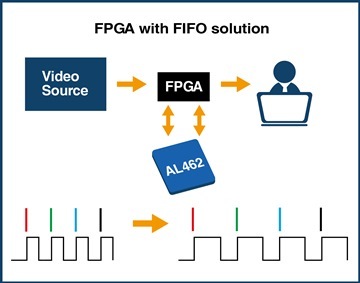 The AL462 UHD FIFO provides the world’s largest and fastest First-In-First-Out (FIFO) data queuing memory used by wide-range 4K2K Ultra HD video/audio applications in broadcast, video surveillance, Medical, Camera Image Processing and Industrial Instrument Markets. 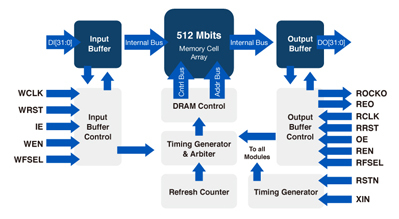 The AL462 consists of 512Mbits memory size and can be configured as an 16Mx32-bit or 16Mx16-bitx2 bus interface and operated at maximum R/W speeds up to 150 MHz; equivalent to 9.6GB/sec of simultaneous read/write data throughput. The AL462 UHD FIFO provides easy-to-use I/O interfaces and controls, such as selectable control signal polarity, two frame buffer modes, facilitating usage in multimedia systems, video capture systems and various video data buffering applications. Manufactured using state-of-the-art technologies and available as a 249-ball LFBGA package, allow product designers to keep power consumption and real estate to a minimum.